Fantastic – her clothes are strangely like camouflage. Cool HDR composition, vivid colors! can you imagine dedicating your life to any “higher power” and creating something this intricate? But I’m glad that some people could – otherwise the world would lack some astonishing buildings and art. Marvelous photograph. The textures are knockout. Well, I actually didn’t really do much with the picture, except making the colours a bit more intense. Stunning. What a wonderful thing to capture. This is simply gorgeous, Rabirius. Colors, shapes, composition and mood all coming together. Thank you very much for your comment and your compliments, Jane. I’m glad you love it, Victoria. This is great ~ everything about this shot seems to come together: isolation, but so much busy-ness along with the colors. Very cool. Thank you very much, Dalo. I instantly noticed that it would be a great photo to take the woman in front of the Mausoleum. 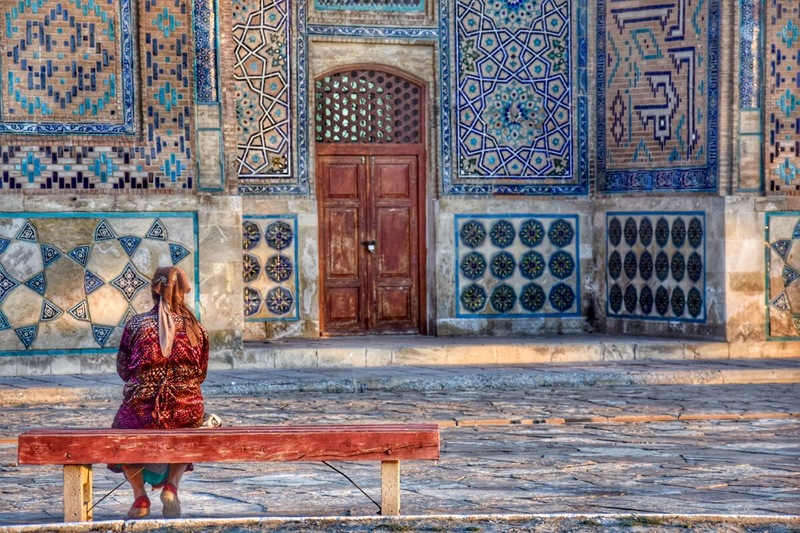 I could sit on that bench for hours and hours staring at the beautiful tiles, one by one… thank you for this wonderful image. Thank you. Yes, the building is really beautiful. I walked around it several times to marvel at the tiles and the architecture.